Donald Trump’s election is often attributed to the anger felt by many members of the white working class, particularly in the Rust Belt, about the current economic situation. The latest update of the Chicago Booth/Kellogg School Financial Trust Index survey supports this view, showing that low-income white non-Hispanics are angrier than most other demographics. 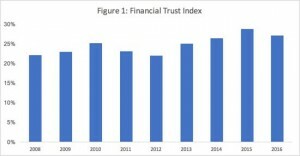 Since the election, trust in private institutions decreased while trust in banks remains stable, according to the survey. 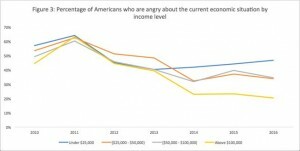 The dispersion of anger about the current economic situation across respondents with different household incomes, however, has increased dramatically; those with the lowest household income are angrier than those in the middle and upper middle income levels, particularly over the last four years. 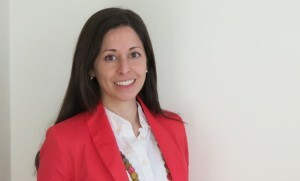 When analyzed according to race and ethnicity, the survey shows that white non-Hispanics were angrier about the state of the economy than black non-Hispanics until 2015, after which time the pattern reversed; among racial and ethnic groups included in the analysis, Hispanics appear to be the least angry over the last seven years. The Financial Trust Index measures the percentage of Americans who trust stocks, banks, mutual funds, and large corporations. Between 2008 and 2016, confidence in private institutions increased by 5 percentage points. Over the past year, however, the level of trust in private institutions among Americans seems to have declined (from 28.76 percent in 2015 to 27.13 percent in 2016). We also study trends in individual components of the index. 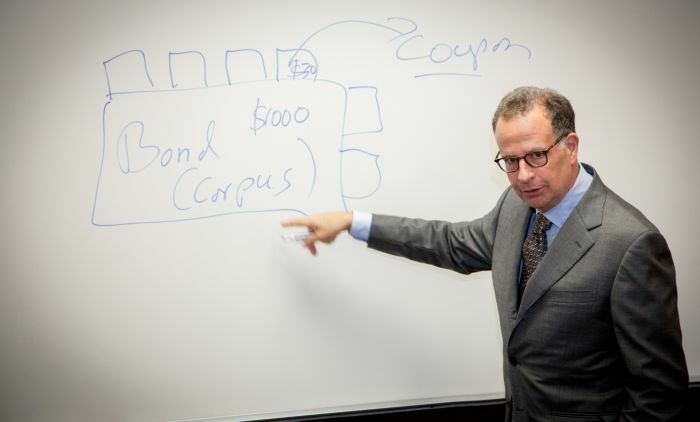 Figure 2 shows trust in various types of banks. 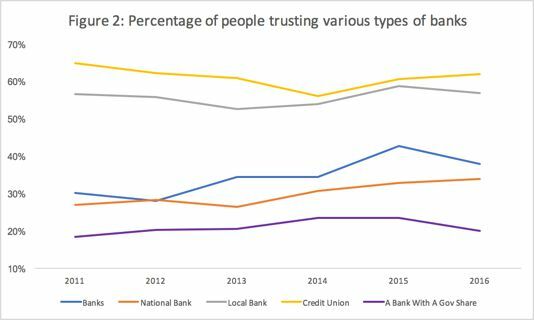 As the Figure shows, people trust credit unions and local banks more than banks with a government share (on average, 60 percent against 20 percent). While the confidence in banks increased until 2015, it then decreased by 5 percentage points in 2016. Trust in local banks had also increased until 2015, but declined slightly in the last year. Our data contains questions about respondents’ anger about the current economic situation from 2010 to 2016. We can study how that varies by wealth and race/ethnicity. We find that over the last seven years, respondents in the wealthiest households seem to be less angry about the current economic situation than those who are less wealthy. While the level of anger has declined for all levels of wealth until 2013, it recently started increasing again, especially for lower income households (Figure 3). 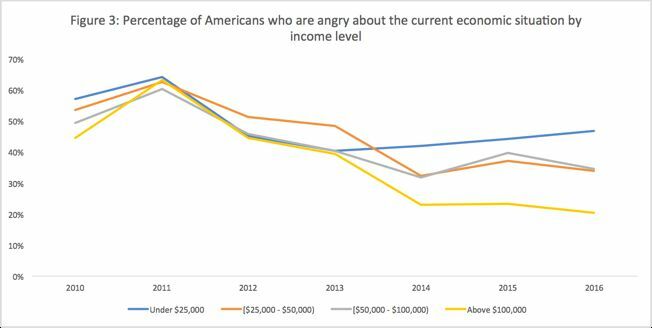 As Figure 3 shows, respondents with household incomes of less than $25,000 per year are angrier about the current economic situation than respondents at all other income levels, and their anger has been steadily increasing since 2013. Only 20 percent of respondents with household incomes in the top 15 percent of the income distribution felt angry about the current economic situation in 2016. On the other hand, almost 50 percent of those with household incomes below $25,000 (30th percentile of the income distribution) felt angry about the current economic situation. We can observe similar trends when anger is analyzed by race and ethnicity (Figure 4). Overall, anger among groups included in the analysis has been declining since 2010. 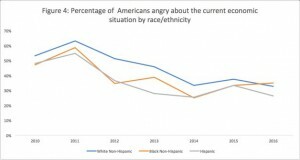 Through 2015, white non-Hispanics tended to be angrier on average, but in 2016 the pattern reversed and they reported being less angry about the current economic situation than black non-Hispanics. Over the last seven years, Hispanics on average have been the least angry (36 percent). 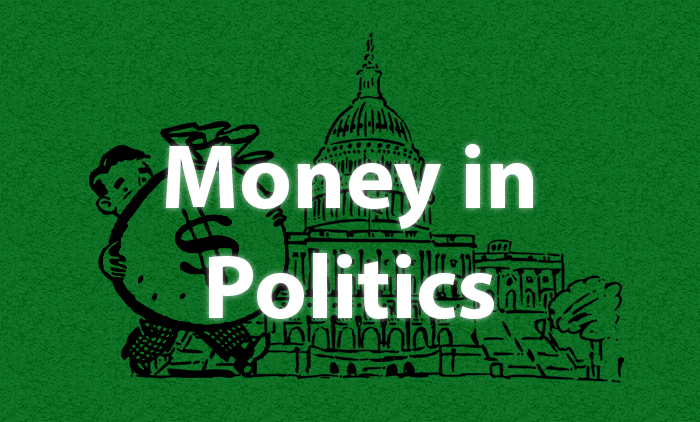 Interesting patterns also emerge when studying the interaction of income and race/ethnicity. Since 2014, we find that respondents with lower household incomes (earning less than $25,000 per year), regardless of race or ethnicity, tend to be the angriest. As their level of household income increases, non-Hispanic whites and Hispanics are less angry about the current state of the economy. At the same time, non-Hispanic blacks with incomes above $25,000 also tended to be less angry about the economy over time, but this pattern reversed in 2016, showing an increase in anger. 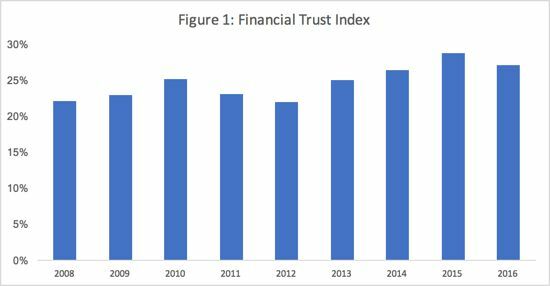 The Financial Trust Index captures the amount of trust that Americans have in the institutions in which they can invest their money. 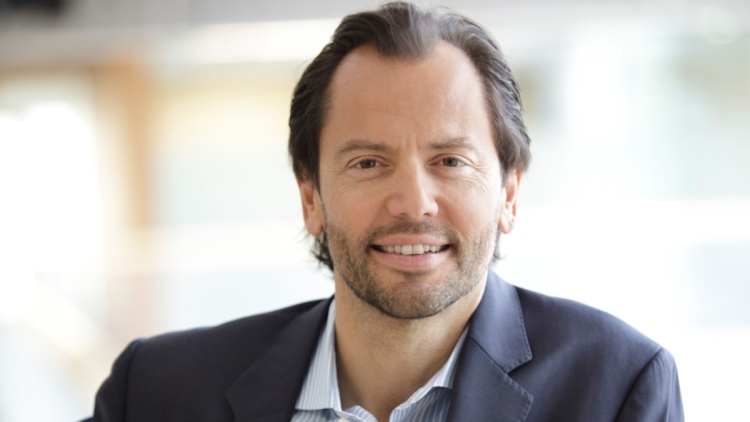 The study was conducted for the Financial Trust Index via telephone by SSRS, an independent research company. Interviews were conducted from December 27, 2016 to January 3, 2017 among financial decision makers. Race and ethnicity are self-reported by respondents using the following categories: White non-Hispanic, Black non-Hispanic, White Hispanic, Black Hispanic, Asian/Chinese/Japanese, Native American/American Indian/Alaska and Native Hawaiian, Other Pacific Islander, and Other. Due to the small sample size, Asian/Chinese/Japanese, Native American/American Indian/Alaska and Native Hawaiian, Other Pacific Islander, and Other, were removed from this analysis.